Anders Matthesen has abillities like few other comedians in the world. His diverse cast of eccentric characters that function as caricatures on the stereotypical personalities we encounter are both obnoxious, hilarious and likable at the same time. With his infallible and characteristic voicing talent he makes flawless use of danish slang and culture to poke good-hearted fun at the current generation of youths, parents, teachers and even musicians. The best part is that all the above functions as a scaffold on which a quite unique and captivating tale is told, whereas his previous movie "Terkel i Knibe" was a more two-dimensional collection of crude albeit funny gags. I won't spoil any details though. This time Matthesen has opted to have the main character be voiced by someone other than himself. This gives the feeling that the boy is trying to navigate in Matthesen's unpredictable universe, and one can't help but root for him. 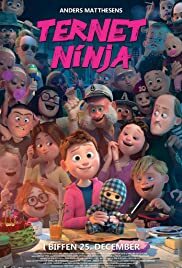 In spite of crude humor and an especially brutal scene early on, the movie as a whole ends up being heartwarming, and when the credits roll you realize that you've been fully attentive and entertained for the duration of the film. Matthesen is one of the most, if not THE most iconic danish comedians which he certainly establishes with this achievement. I hope the title will reach a wider audience as it certainly deserves more attention and recognition.